Youth camps are always action-packed! Whether it’s a camp that’s open to all or specifically focused on the leaders of the campus ministry, one major upside are the relationships developed by the end. There’s just something about staying in the same place, going through those embarrassing games, and worshiping God together that brings young people together. People who used to feel out of place in the youth service now come alive. 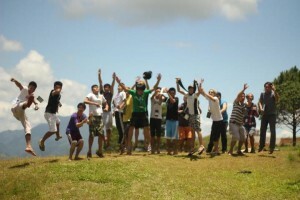 Teenagers who were brought reluctantly by their parents leave the camp feeling quite at home. It isn’t uncommon to see people exchanging contact information, writing each other dedications on their notebooks, and promising to meet up soon – even though they’ll see each other within a few days in Manila. Childish sentimentalism? Maybe. Useful for ministry? You bet. Whether a student joins the camp alone or with friends, at the end of the day he/she will surely go back home with even more friends. This is a no-brainer, but it should be mentioned anyway. I’m not saying we can’t encounter God anywhere else but there’s something about being out of your usual habit, being in nature, and worshipping God that seems to break through the usual noise of every day life. I remember being 16 years old, singing a worship song when I suddenly felt a compulsion to get on my knees and cry out to God for the nations. I think I knew then that I would be doing this for the rest of my life. Many people in the Bible, in history, and in our movement have received their calling in similar encounters with God. Church kids who saw Victory as “my parents’ church” now see it as “my church” because of their encounter with God. Young people falling on their knees as they encounter God in one of their sessions. Camps cost money and one must walk the fine balance of helping out when possible but also encouraging the students to believe God for provision. Many students work, sell, save, and ask to raise the money. In fact, seeing God provide is like the opening salvo to a powerful encounter with God. 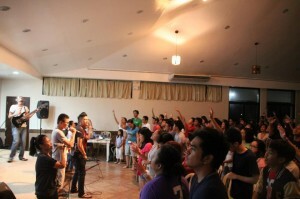 Dan Monterde, our campus director and youth pastor in Metro East, had one such encounter. He was new in church and wasn’t sure if he could make it to the camp. He thought, “Pangmayaman lang yan,” until a random church member went up to him and gave him money for registration saying God had led him to do so. That was a powerful lesson for Dan that God was his Father and this Father’s resources were unlimited. There are so many more stories like that and it compounds even more as these recipients of generosity gratefully pass on what they received to another generation. Joining a youth camp costs. But the experience is priceless. Running a camp is hard! Securing the venue must be done months in advance—it has to be nearby, affordable, securable, and conducive to all the events. Planning it can be a fruit-testing process because you have to deal with students who change their minds, parents with weird special requests, money concerns, weather changes, bus drivers who are uncooperative, health precautions, etc. And this is all a great time to develop new leaders. 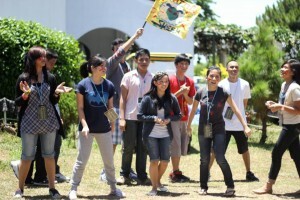 For many student leaders, running a camp is a time when they can get a taste of real campus ministry. We will not shrink back from asking the students to carry heavy loads of responsibility because a.) we really need the help (at least honest), b.) this will propel them to greater maturity, and c.) God has promised to pour out His spirit on them so they can do it! These students are the future leaders of our nation! Maybe it’s the “mountain-top experience” where people come from the mountain to go back to the world. Or maybe it’s the company of brothers and sisters encouraging each other that we can go and reach our campuses for Jesus. Or maybe it’s because the stars are just brighter outside of Manila. For whatever reason, when these students have that powerful time with God in the camps they go back to their homes and schools ready to advance God’s kingdom there. We’re now ready to change our campus! Joseph Bonifacio is the Executive Director of Every Nation Campus, a nationwide campus organization passionate about preparing students for LIFE. He also serves as a volunteer pastor in Victory Fort Bonifacio. Hi i would like to inquire if you have groups for youth for my daughter in college, here in Makati and QC if possible. Please text me at 09167064873.